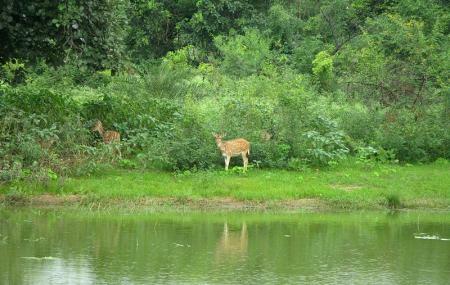 The Van Vihar National Park is adjacent to the Upper Lake (Bhojtal) and is loved for its treasured wildlife. The park covers an area of around 4 and a half square kilometers and offers encounters with tigers, lions, panthers, Hyenaa, sloth bears, sambar, Chital, Nilgai, Blackbuck, Chousingha, Common langur, Rhesus macaque, Wild boar and Porcupins among others. The place is home to 200 species of birds and preserves a deciduous scrub forest flora. Take a wild safari trip here as you come face to face with the animals and see a part of Bhopal that would otherwise be lost! Do wear sturdy shoes and appropriate clothes. Entry fee for Children: Free entry fee for school & college children and senior citizens. How popular is Van Vihar National Park? People normally club together Bhadbhada Dam and Madhya Pradesh Tribal Museum while planning their visit to Van Vihar National Park. Nice place.. In the winter it is a great place to walk or cycle. The park was not crowded and gives you solitude while observing animals. Van Vihar National Park is a national park in central India. It is located in Bhopal, the capital city of Madhya Pradesh. Declared a national park in 1979, it covers an area of about 4.45 km2. Although it has the status of a national park, Van Vihar is developed and managed as a modern zoological park, following the guidelines of the Central Zoo Authority. The animals are kept in their near natural habitat. Most of the animals are either orphaned brought from various parts of the state or those, which are exchanged from other zoos. No animal is deliberately captured from the forest. Van Vihar is unique because it allows easy access to the visitors through a road passing through the park, security of animals assured from poachers by building trenches and walls, chain-link fence and by providing natural habitat to the animals. Was there for about 2 hours, which was still way short for exploring the entire park as I couldn't explore a few parts. Enjoyed my time there a lot. Kudos to MP and Bhopal! Pros about the place: •Well maintained •Cordial staff •Cheap •Provision for cycling/ 2 wheeler/ auto/ car/ jeep to explore at additional cost. •Beautiful wildlife with many animals and birds. Cons: Nothing really! Take your kids and family here for a weekend, they'll love it! Teens or youth will definitely find the place picturesque especially during the evening, with beautiful roads and trees. The place gave me so many beautiful photos! Must visit if you're in Bhopal. Green and clean eco park with various animal enclosures. Rent a bike via App and Enter from one side and exit from other. You can take your own cycle or vehicles too. Ticket price is nominal. Takes about two to three hours. Located close to museums like tribal and state museum. Recommended to visit early morning or evening hours. Well maintained, clean, green and noise free area. Way better place for cycling along with fresh air and green view at morning and evening too. Only the cycle available there are old so doesn't makes the cycling a comfortable one.